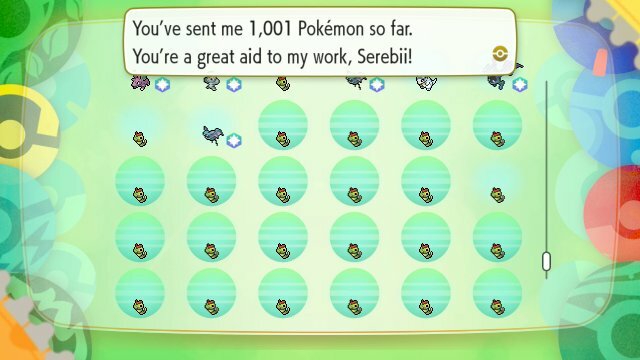 As there's a limit of only 1,000 Pokémon you can store in the game at any one time, space quickly runs out so the option is to Send the Pokémon to the Professor. This removes the Pokémon from your box, just like releasing it in previous games. However, in these games, there's a bonus for doing so. When you transfer Pokémon, you will get various Candy for doing so. You will get 1 Candy for each Pokémon transferred. This Candy is determined based upon the species and can be the Candy, Candy L or Candy XL variety. The more Pokémon you send to the profressor, the better the rewards. In addition to that, every 50 of the same species you transfer to the Professor will result in you getting 1 of that Pokémon's specific species Candy so transferring a total of 50 Caterpie will result in getting 1 Caterpie Candy. In addition to this, if you transfer Pokémon who have been given AVs, they are more likely to produce Species Candy.